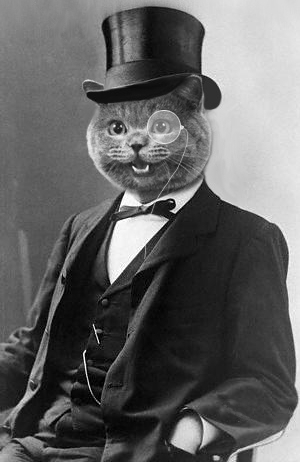 TabbyDasher Written by cats, for cats. Nintendo loves the Pokémon franchise – because each new game gives them an opportunity to shake down consumers two to three times for the same game. By adding a few exclusive monsters or making minor changes to the game, they convince many fans to repurchase it multiple times. But that's just the beginning. Nintendo will gladly charge you for that same game 2 or 3 more times over the next 10-20 years. In some ways, Nintendo's marketing of the Pokémon games reminds me of a television infomercial that dupes people into signing up for a recurring credit card charge. The customer thinks they're ordering a single item, but in reality they're signing up for a "club" that will auto-bill them for product refills every few months. It's not illegal, but it's shady – as is Nintendo's tactic of persuading fans to buy the same games over and over. First, two versions of a new Pokemon game are released simultaneously, with each offering a handful of exclusive pokémon (and in the latest game, one location that is different.) When sales taper off a year or two later, they often release a third version that includes all the exclusive Pokémon and some minor fixes and tweaks that should have been included in the first two versions. Years later, they may also try to resell you the game on each of their their virtual consoles. And they may also remake the game so that they can sell it to you on their current handheld (after they've dropped support for the system the game was originally released on.) And sadly, today's Pokémon games only include one game save slot – which prevents siblings from sharing a single game card. Not only do you need to "catch 'em all", but every kid in the house also needs to have their own copy. They'd also prefer that each child have their own handheld as well, so they tie each game's online profile to a single piece of Nintendo hardware. You don't have to buy multiple copies of a CD if you want to play it on each new stereo you get over the years, or to play it in your car. You don't have to buy the same CD again if you want to rip mp3 files from a CD for your iPod. You don't need to buy a new CD for each kid in your house who wants to listen to it. And you don't have to buy a CD multiple times to get access to all of the songs on an album. Likewise, you shouldn't have to buy multiple copies of a game to do these kinds of things. Recently some of Nintendo's licensees are getting into the act, too. With the release of Pokémon Black/White, Prima Publishing emulated Nintendo's marketing tactics by breaking their official strategy guide for Pokémon Black/White into two volumes, with each selling for $19.99. Prima took the vital components of a complete guide (walkthrough, Pokédex, post-game info, etc.) and spread them out across the two volumes such that consumers must buy both to get what was once sold as a single, complete guide. They also released a third version of the guide (a $29.99 hardback edition of volume one), but instead of giving customer's a complete guide for that price, they only threw in one extra section from the second volume. So even if you buy the deluxe volume 1, you still need to buy volume 2. Either way, a complete strategy guide (both volumes) ends up costing more than the game itself. Pokémon Black / White / ?? I'd love to see a new Tingle game on the 3DS, with an english translator involved from day one to allow for a simultaneous worldwide release. 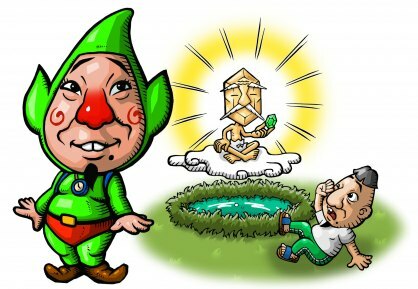 In the first Tingle game, Tingle was cursed by a mysterious older man claiming to be his uncle, who then blackmailed Tingle into earning rupees – which basically explained Tingle's obsession with rupees in the Zelda games and also how he became a fairy. In the second Tingle game, Tingle got sucked into an infomercial for a self-help book about how to seduce women, which led to a point-and-click RPG based on the Wizard of Oz – with Tingle as Dorothy. What would be a good premise for a 3rd Tingle adventure, this time on the 3DS? 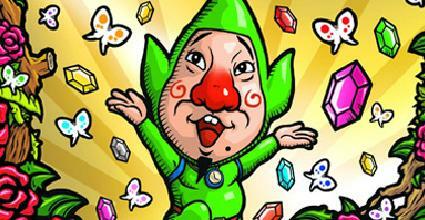 As the game begins, Tingle is still living alone in his little house – and he's newly unemployed. That's when a mysterious benefactor shows up and offers Tingle a new career as an interior decorator. As the game progresses, Tingle explores his region of Hyrule, encounters local people with decorating problems, and accepts jobs to help them. 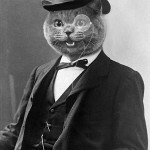 Some examples include remodeling Zelda's vacation cottage to make it kidnap proof, sprucing up a depressed artist's tiny live/work space to get him inspired again, creating a swinging bachelor pad for an old man whose wife ran off, turning chaos into harmony for a local cat lady living with dozens of felines, improving conditions in a hen house to increase egg output and stop attacks by angry chicken mobs, furnishing a bottle to meet the requirements of the local healing fairies who have gone on strike and are refusing to be bottled anymore, etc. With the money earned from interior decorating, Tingle can design, build, and decorate his own dream home from the ground up, with the ability to host visitors over wi-fi and to send "virtual walkthroughs" to friends that allow them to explore and interact with your dream home. You can place cardboard cutouts of yourself in rooms, with text messages that offer explanations or give hints about false walls, secret passages, etc. Each object you place can include a short text message. So if a visitor tries to interact with a vase, it can trigger a text message saying, "Don't touch, it's Ming!" or "What are you looking for?!" etc. As your dream home gets bigger, Tingle's brothers will come to live with him one by one and they can each be assigned to perform tasks such as collecting raw materials from specific regions, keeping squatters and monsters out of the construction site, etc. During some of his jobs, Tingle will discover passages to catacombs and dungeons. 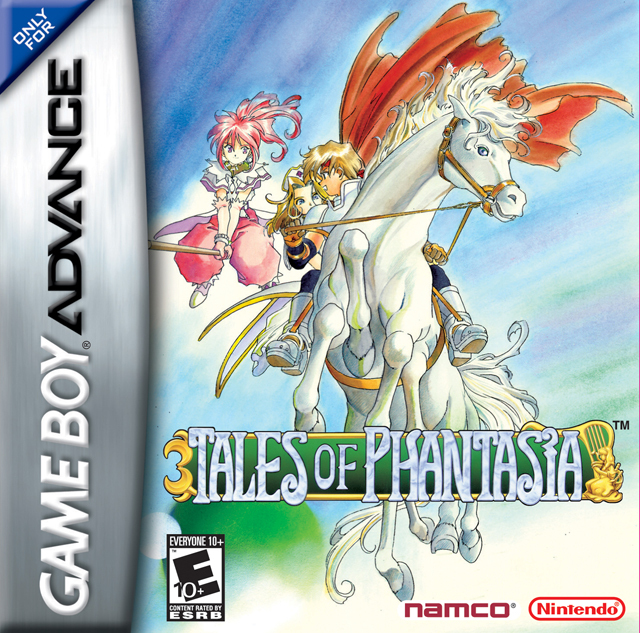 This will lead to gameplay sequences with zelda-style action adventuring and also first-person, 3D dungeon-crawling like in Phantasy Star 1. By fighting monsters/ghosts/animals and collecting/selling raw materials, Tingle can earn extra money or can combine the raw materials to create new accessories for his dream home and his decorating jobs. During the dungeon sequences, Tingle employs unconventional makeshift weapons that a decorator might have such as hammers, staple guns, hot glue guns, bedazzlers, throwable bric-a-brac, craft knives, blinding glitter, etc. He can also learn special decorator magic such as Water Feature, Paint Job, Focal Point, Window Treatment, Shabby Chic, Ikea, etc. Where are all the N64 games on Nintendo’s Virtual Console? I never owned an N64 system, so those are the games I've been most interested in exploring on the Wii's Virtual Console. However, it's now been almost 4 years since the Wii's launch and the N64 is still one of the Virtual Console's least represented systems. 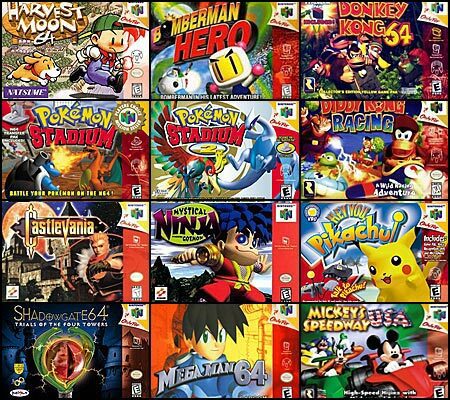 During the lifetime of the N64, 387 titles were released – but less than twenty of them are represented on the North American Virtual Console. 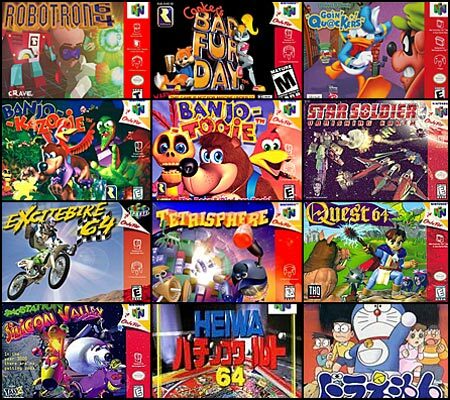 You can find the full list of N64 games on Wikipedia. This year, Nintendo finally seemed to address core-audience complaints about the Wii's casual-heavy software library. The company's announcement of Super Mario Galaxy 2, Metroid: Other M, and Zelda 2 seemed to demonstrate a renewed focus on high-quality, core gaming experiences. But just as core-fans were cautiously heralding a new "golden age" of first-party software development, Nintendo announced surprise changes to the previously announced Q3/Q4 release schedule. These changes left core gaming fans dumbfounded. According to industry analysts, Nintendo's revised Q3/Q4 line-up indicates a dramatic philosophical shift that has come from the Kyoto-based company's highest levels. Even the most notorious third-party developers of "shovelware" are now referring to Nintendo's new strategy as "Blue Ocean Fundamentalism" and "Casual Gaming Extremism." Here's what we know so far about Nintendo's revised Q3/Q4 lineup for Wii and DS. 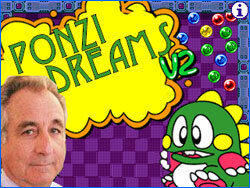 A new "financial puzzler" for Nintendo's under-explored fifty-something crowd. 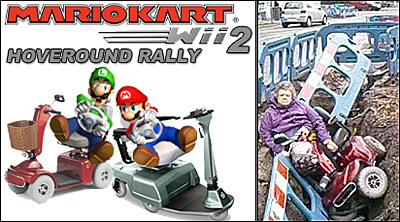 Even core titles can appeal to non-gamers when given the right spin – just as long as that spin goes no faster than 3 mph. As a special bonus, gamers with Medicare coverage may not have to pay a penny for this game – and Nintendo can even pre-authorize you over the phone. 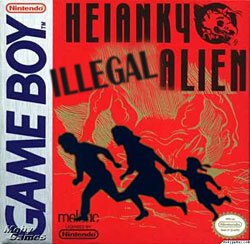 A new twist on the classic Gameboy puzzler, re-designed to appeal to angry, uninformed white trash. 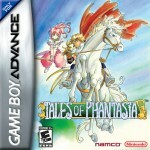 This is a 2-for-1 value title that also includes the multi-thousand-selling hit Mario Tea Party. Learn to use the new Hot Flash mode to your advantage as you explore the best years of your life. Collect hormone pills to regain health, experiment with shabby chic, customize your character with plastic surgery, and face down urban cougars as you search for seven legendary self-help books that contain The Secret. Use your own children as weapons in this innovative hybrid of courtroom drama and first-person shooting action. Prepare your own living will as you uncover the secret motivations of relatives and friends using short, pick-up-and-play surveys. You can also catalog and bequeath all of your worldly possessions – and best of all, explained Nintendo of America president Reggie Fils-Aime, "It's a cool rhythm game featuring the music of Rihanna." Will they resuscitate you? When should they pull the plug? With Touch Generations: Advanced Directive, you're in charge. In this updated remake of the updated remake, the castle's countless staircases have all been retro-fitted with fully automatic chair lifts, allowing you to maintain your independence throughout countless sequels. Other enhancements include wheelchair ramps on all ledges, senior discounts at all shops, clapper-controlled lights and machine-devices, and the new "Handy Grabber" tool for out of reach power-ups. Chart your senescence over time as you remain motionless in order to earn cholesterol points that can then be used to outfit your avatar with cool accessories. Unlock a variety of locations such as bed, recliner, couch, grave, and urn. More and more TV broadcasts are switching to digital cable – and both military radar and cellphone traffic are now spreading their signals out across a large number of channels (thereby taking on the appearance of random radio noise). As a result, the Earth's radio chatter is quickly going silent. If human beings are already phasing out radio broadcasting, what makes us think a more advanced alien civilization would still be using it – and how can we expect to detect them using radio telescopes? In response to this argument, researchers at the SETI Institute are rethinking their methods. Some believe that SETI must try to imagine the kinds of technologies that an advanced alien civilization would be using – but how can we predict the capabilities of a species thousands or even millions of years beyond our own? In her informative article for Science News, Can You Hear Me Now?, Elizabeth Quill examines both the problem and SETI's response. For an interesting look at the inverse of this issue, check out SETI's Interstellar Message Composition page, which considers the problem of constructing a message that would be understandable to an alien civilization. Find more free remixes at OverClocked ReMix! 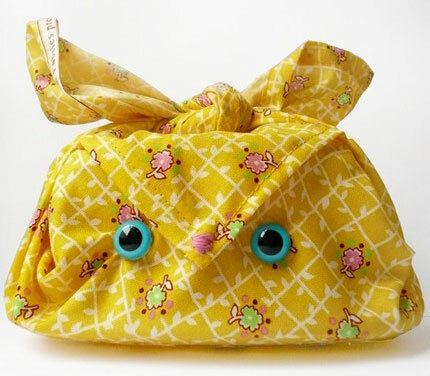 Furoshiki, which originated in the Edo period in Japan (1603 to 1868), were square pieces of cloth originally used to create satchels or backpacks that carried belongings such as clothing, books, or food. 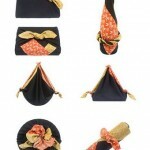 Over time, furoshiki came into use as an elegant gift wrapping and a way for some merchants to package their goods. 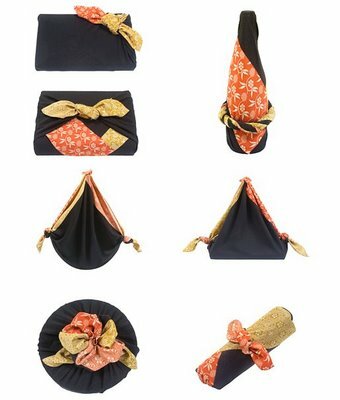 Besides a simple satchel, a furoshiki cloth can be coaxed into performing a wide variety of tasks and a sheet of appropriate size can conform to almost any kind of gift. 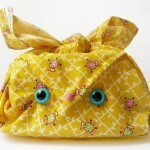 Furoshiki cloths now come in beautiful prints and a variety of different fabrics. They've come back into vogue recently because they represent a re-usable, environment-friendly alternative to traditional wrapping paper. Many people also use them daily to transport their bento box lunches. 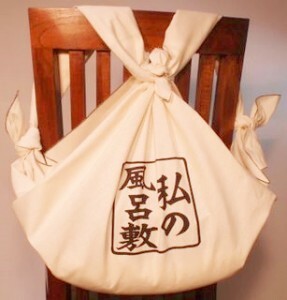 Once the bento box lunch is unwrapped, the furoshiki cloth can then serve as a placemat. 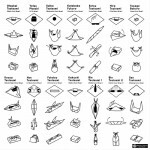 Check out the images below for some common folding patterns. 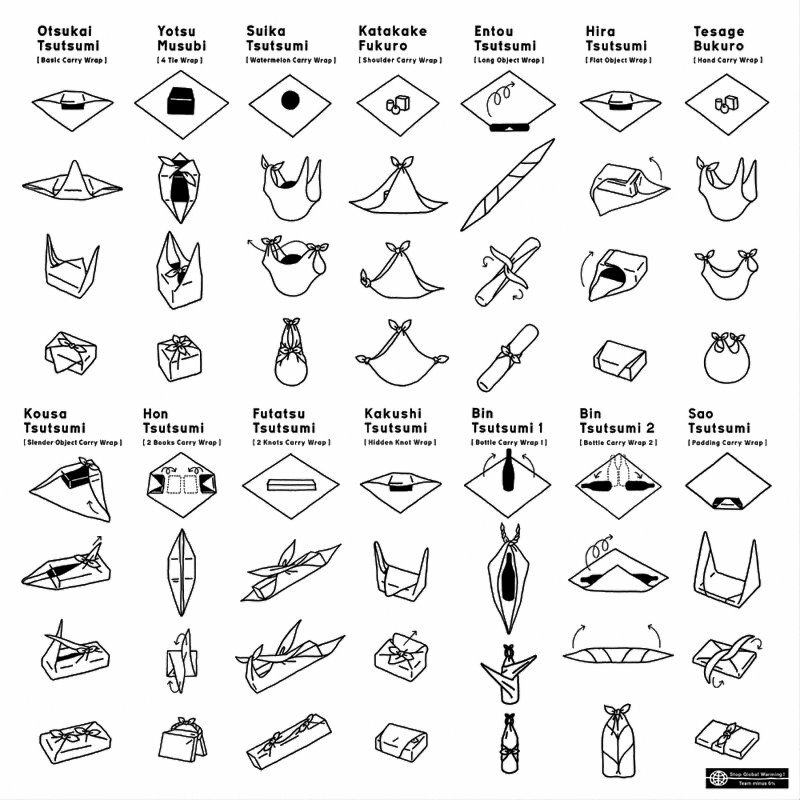 Here's a furoshiki video tutorial. 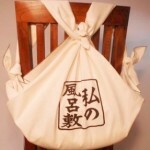 You can buy furoshiki cloths at Etsy and at Furoshiki.com. DIRECTED BY : Jerrold Tarog. WRITTEN BY : Jerrold Tarog, Rody Vera. GENRE : Drama, History, Action, War. PRODUCTION BY : Artikulo Uno Productions, Globe Studios, TBA Studios. Movie 'Goyo: The Boy General' was released in September 5, 2018 in genre Drama. 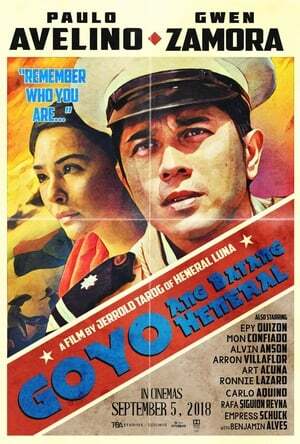 Jerrold Tarog was directed this movie and starring by Paulo Avelino. This movie tell story about With this film (the second war trilogy set during the Filipino-American war in the early 1900s), the revolution marches on against the Americans after the bloody death of General Antonio Luna. The conflicted philosophies behind the heroic struggle continue and become personified in the colorful character of General Gregorio "Goyo" del Pilar. Goyo: The Boy General 2018 movie, Watch Goyo: The Boy General 2018 Online Free Viooz, film Goyo: The Boy General, watch full Goyo: The Boy General movie, Watch Goyo: The Boy General 2018 Online Putlocker, Watch Goyo: The Boy General 2018 Online 123movie, Watch Goyo: The Boy General 2018 Online Megashare, download Goyo: The Boy General 2018 movie now, film Goyo: The Boy General 2018 online streaming, streaming Goyo: The Boy General 2018 film, live streaming film Goyo: The Boy General, Watch Goyo: The Boy General 2018 Online Free netflix, Watch Goyo: The Boy General 2018 Online 123movies, Watch Goyo: The Boy General 2018 Online Free, Watch Goyo: The Boy General 2018 Online Free Putlocker, watch movie Goyo: The Boy General 2018 online now, Watch Goyo: The Boy General 2018 Online Free hulu, Goyo: The Boy General live streaming film, Watch Goyo: The Boy General 2018 Online Free 123movie, streaming film Goyo: The Boy General, Goyo: The Boy General 2018 movie streaming, film Goyo: The Boy General 2018 trailer, Watch Goyo: The Boy General 2018 Online Viooz, streaming movie Goyo: The Boy General 2018, movie Goyo: The Boy General download, Streaming Goyo: The Boy General 2018 Online Free Megashare, Watch Goyo: The Boy General 2018 For Free online, download full film Goyo: The Boy General, Goyo: The Boy General 2018 Watch Online, Streaming Goyo: The Boy General 2018 For Free Online, Watch Goyo: The Boy General 2018 Online Free megashare, Goyo: The Boy General live streaming movie. DIRECTED BY : Cathy Garcia-Molina. WRITTEN BY : Carmi Raymundo. PRODUCED BY : Carlo Katigbak, Olivia M. Lamasan. PRODUCTION BY : ABS-CBN Film Productions. 'The Hows of Us' is a movie genre Drama, was released in August 29, 2018. Cathy Garcia-Molina was directed this movie and starring by Kathryn Bernardo. This movie tell story about "The Hows Of Us" follows the story of young couple, Primo (Daniel Padilla) and George (Kathryn Bernardo), who are in a long-term relationship and are already building and planning their future together. Their love will be put to the test as their relationship faces hurdles - from misunderstandings to different career paths, among others. How will they save their "us"? movie The Hows of Us trailer, live streaming film The Hows of Us, The Hows of Us 2018 Watch Online, Watch The Hows of Us 2018 Online Viooz, Watch The Hows of Us 2018 Online Free netflix, The Hows of Us 2018 streaming, Watch The Hows of Us 2018 Online Free hulu, watch The Hows of Us film online now, Watch The Hows of Us 2018 Online Megashare, Watch The Hows of Us 2018 Online Free Putlocker, Streaming The Hows of Us 2018 For Free Online, Watch The Hows of Us 2018 Online Free Viooz, Watch The Hows of Us 2018 Online Free 123movie, film The Hows of Us online streaming, film The Hows of Us online, Watch The Hows of Us 2018 Online Free, The Hows of Us movie streaming, live streaming movie The Hows of Us, Watch The Hows of Us 2018 Online 123movie, watch The Hows of Us movie now, watch film The Hows of Us now, streaming film The Hows of Us, Watch The Hows of Us 2018 Online Putlocker, Watch The Hows of Us 2018 For Free online, Streaming The Hows of Us 2018 Online Free Megashare, trailer movie The Hows of Us, Watch The Hows of Us 2018 Online Free megashare, watch full The Hows of Us 2018 film, Watch The Hows of Us 2018 Online 123movies, download movie The Hows of Us 2018, The Hows of Us movie trailer. "There is nothing noble in being superior to your fellow man; true nobility is being superior to your..."
"I cannot bear the thought of you in someone else’s arms yet imagining you alone is sad." theghostgirls:There were forests on the way there. "You love people. They disappoint you. But sometimes, they don’t. They just keep loving you, right..."
"Those who love you are not fooled by mistakes you have made or dark images you hold about yourself...."
chrisxstupid: snaacks: snaacks: zoey did the absolute most THE DEATH DROP AT THE END IM ScrEAMIKDN This is my favorite post on this website. "It doesn’t stop being magic just because you know how it works." just-shower-thoughts: Whenever a show/movie gets cancelled the director should release what would’ve happened instead of leaving us hanging. jaw8jaw: From John Cocteau’s experimental film The Blood of a Poet, 1932. "I saw all the people behind their masks - I saw through them and there was suffering."